27 Fantastic Healthy Benefit of Watermelon – Green Fruit Effect! Watermelon is one of the most powerful, body healing, delicious and refreshing, thirst quenching fruit that’s also good for you. The amazing health benefits of watermelon cover everything from your brain all the way to the cells in your feet. The best time to indulge in this fresh, succulent, juicy melon, is summertime, when they are in season and deliver an array of nutrients, vitamin and minerals. This fruit has no fat or cholesterol and very little sodium. It contains only 46 calories per cup, but is high in vitamins, minerals and many healthy plant compounds. It also contains enzymes, organic acids and natural sugars. The water content in watermelon is also extremely helpful in keeping the body hydrated during the hot summer months. There are five common types of watermelon: seeded, seedless, mini (also known as personal), yellow and orange. Now, watermelon is grown around the world, and in 44 of the 50 states in America. It is specifically selected to grow larger and juicier, resulting in the huge fruits that many of us are familiar with. The green outer rind is hard and fleshy, and rarely eaten, while the interior is soft, red or pink flesh containing the many seeds, this is the part of watermelon which is typically eaten. As for accessing the total medicinal benefits of watermelons, it is highly dependent on the variety of watermelon and the ripeness. Beta carotene and lycopene is usually bio-available in the highest quantities once the watermelon is completely ripe, by organic facts.com. The long list of healthy or beneficial effects of watermelons are mainly derived from its unique nutrients, vitamins, minerals, and organic plant compounds. These include significant amounts of vitamin C, calcium, magnesium, fiber, protein, iron, calcium, phosphorous and a very large amount of potassium. Furthermore, they contain vitamin A, vitamin B6, niacin, thiamin, and a wide variety of carotenoids and phytonutrients, cucurbitacin E, including lycopene, by organicfacts.net. Watermelon contain a lot of water and could remain edible for weeks and even months as long as they were kept in cool, shady areas. During dry seasons, their water would have been extracted. Make this melon a part of your daily diet and get fit, healthy body. 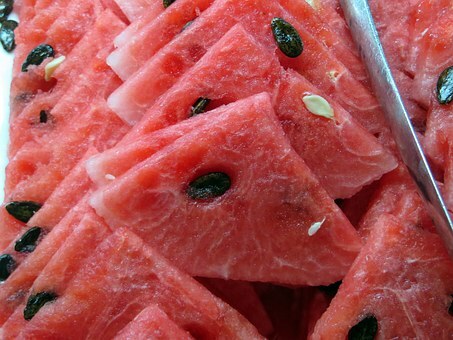 According to livelovewpenine.com, Watermelon is rich in phenolic compounds like flavonoids, carotenoids, and triterpenoids. The carotenoid lycopene in watermelon is particularly beneficial in reducing inflammation and neutralizing free radicals. The tripterpenoid cucurbitacin E is also present in watermelon, which provides anti-inflammatory support by blocking activity of cyclo-oxygenase enzymes which normally lead to increased inflammatory support. Make sure you pick ripe watermelons, because they contain higher amounts of these beneficial phenolic compounds. Type 2 diabetes especially is a metabolic disorder that is characterized by hyperglycemia and developing insulin resistance. In this type of disorder, your body produces insulin, but your body’s cells become resistant to the effects of the insulin. By organicfact.net, diabetic patients, who are supposed to have a low energy and low sugar diet, often complain about starving since they don’t get to eat their staple diets, which gives them the feeling of being half fed. Watermelons can be a good supplement for them. In spite of being sweet in taste, a thick wedge will give you very few calories, since ninety nine percent of its total weight is composed of water and roughage. Moreover, the various vitamins and minerals such as potassium and magnesium help in proper functioning of insulin in the body, thus lowering the blood sugar level. Arginine, another component found in watermelons, is very effective at enhancing the impact of insulin on blood sugar. Diabetic patients can also have curries, steaks, and salads made from water melon rinds, which are even lower in sugar. Researchers have studied lycopene and other individual plant compounds in watermelon for their anti-cancer effects. Some compounds in watermelon, including cucurbitacin E and lycopene, have been studied for their potential to prevent cancer. By organicfacts.net, watermelon’s impressive level of lycopene, a carotenoid phytonutrient compound that is increasingly being linked to cancer prevention. As the years go by and the studies continue to bring in consistent results, lycopene has been shown to significantly reduce the risks of prostate, breast, colon, lung, and endometrial cancer. All in all, between the antioxidant potential of vitamin C and the impact of lycopene, watermelon is a great anti-cancer fruit. Several heart-healthy components, including lycopene, citrulline and other vitamins and minerals in watermelon have specific benefits for heart healthy. Lycopene, a carotenoid found in abundance in watermelon, improves cardiac functions. Beta carotene, known for its remarkable antioxidant and anti-aging properties, also keeps you young at heart and prevents age-related cardiac problems. The roughage in water melon and its very low energy, along with help from vitamin-C, carotenoids and potassium (potassium cuts the risk of a heart attack), helps to reduce cholesterol and keep your heart safe from a variety of dangerous conditions,by organicfacts.net. Watermelon and watermelon juice have been shown to reduce muscle soreness and improve recovery time following exercise in athletes. Researchers believe this is likely do to the amino acid L-citrulline contained in watermelon. Watermelon juice has some potential as a recovery beverage after exercise. Citrulline may be partially responsible for its effect of easing muscle soreness. Therefore, not only is watermelon and its high citrulline content beneficial for post-workout recovery, but it may also be good in pre-workout regimens since it allows for more intense training and faster recovery after each workout. watermelons are packed with both lycopene and a bit of calcium as well, which makes for a superfood that your bones will love! Inflammation is a key driver of many chronic diseases. Lycopene and vitamin C are anti-inflammatory antioxidants found in watermelon. Inflammation is linked to many chronic diseases. vitamin A is a primary vitamin that helps our eyes stay healthy. A deficiency of such a vital vitamin can cause macular degeneration and xerophthalmia. Plus, watermelon has vitamin C, lutein and zeaxanthin that are essential to keep your eyes healthy and free from different types of infections.Eating one cup of watermelon daily is recommended for your overall vision health. Watermelon contains lots of water and a small amount of fiber — both of which are important for healthy digestion.Fiber can provide bulk for your stool, while water helps keep your digestive tract moving efficiently. Unfortunately, doctors have come to realize that both chronic and low-grade inflammations are common causes and/or symptoms for many diseases, such as obesity, diabetes, and even such muscular disorders as Duchenne muscular dystrophy (DMD). In such a disorder, there is severe muscular degeneration that leads to chronic inflammation, among other things. When L-arginine was used to treat subjects with induced DMD, the treatment also inhibited the (NF) –κB cascade, thereby promoting muscular membrane integrity and posing as a therapeutic option for DMD management. Vitamin C helps your body make collagen, a protein that keeps your skin supple and your hair strong.Vitamin A is also important for healthy skin since it helps create and repair skin cells. Without enough vitamin A, your skin can look dry and flaky. Both lycopene and beta-carotene may also help protect your skin from sunburn. According to livelovefruit.com, Watermelons have an alkaline-forming effect in the body when fully ripe. Eating lots of alkaline-forming foods (fresh, ripe, fruit and vegetables) can help reduce your risk of developing disease and illness caused by a high-acid diet (namely, meat, eggs and dairy). Reducing your acid load and focusing on alkaline-forming foods has been found to prevent loss of muscle mass as we naturally age, and it has also been suggested that supplementation of alkaline minerals may improve chronic back pain. According well-beingsecrets.com, vitamin C, or ascorbic acid, is involved in all phases of human wound healing. The recommended daily amount of vitamin C is around 60 mg, but many researchers are beginning to find that supplements of this nutrient that are far above the recommended daily amount may actually have a beneficial role in speeding up would healing. By well-beingsecrets.com, we need antioxidants and cofactors, nutrients that our body cannot synthesize, to further neutralize these harmful demons. Unfortunately, oxidative damage by free radicals is only a normal occurrence. Our natural endogenous system essentially protects us from the damage. We need antioxidants and cofactors, nutrients that our body cannot synthesize, to further neutralize these harmful demons. It is believed that oxidative damage has a key implication in overall aging as well as various diseases and age-related disorders. Fortunately, common vitamins and nutrients, such as vitamin C, provide exceptional protection from the harm that free radicals cause. Consuming the recommended daily amount of vitamin C, whether through supplements or such fruits as oranges and watermelon, will help keep the oxidative damage to a minimum and leave your body feeling as healthy as ever. According to well-beingsecrets.com, due to watermelon’s high amount of vitamin C, which helps ward off and prevent many diseases and health issues, one being gum disease. Periodontitis is a slowly progressing infectious disease in tooth-supporting tissue. Periodontal inflammation can even result in gingival bleeding, pocket formation in the gums, and eventually loss of teeth. Vitamin C is known to help with collagen synthesis and is clearly required in times of infectious diseases. In such gum diseases as periodontitis, the tooth tissue is attacked by bacteria, so vitamin C is needed by the body to help repair the damage and regenerate new tissue. Because watermelon is so high in vitamin C, this summer fruit can help you keep your teeth looking clean and fresh. Since we require ascorbic acid to survive and fight off infections, it is necessary to have the recommended daily amount to stay healthy. The main role of ascorbic acid is to absorb iron from the intestinal tract. When we do not have enough of the vitamin c, our body cannot keep up with the amount of iron that needs to be absorbed, leaving the patient lethargic, fatigued, and possibly anemic. The longer a person lasts without the proper amounts of vitamin C, the more severe the symptoms become, leading to edema, jaundice, neuropathy, and even death. This disease is almost entirely preventable, though, and simply monitoring your own intake of vitamin C and not going days and weeks without this essential vitamin can help prevent it. This thirst-quenching fruit helps keep the body hydrated. Watermelon contains more than 90% water and helps replenish body fluids and restore electrolytes. It also contains essential rehydration salts–calcium, magnesium, potassium and sodium – that help hydrate the body and skin and reduce the chance of dehydration to a great extent. By top10homeremedies.com, Watermelon can also improve your mood. It is high in vitamin B6, an essential nutrient that is important in the synthesis of certain neurotransmitters responsible for calming mood. Plus, its high vitamin C content protects the body against free radicals. Free-radical damage contributes to cognitive decline, irritability and depression. Watermelon also helps balance hormones, which can affect your mood when out of balance. Watermelon is a surprisingly healthy fruit. It has a high water content and also delivers many other important nutrients, including lycopene and vitamin C.
Lypocene is found to be effective in repairing damaged tissues. Watermelon seeds are rich in beneficial fats and proteins. Watermelons also contain phytonutrients which have very good effects on the health and proper functioning of internal organs, eyes, and the secretion system. These nutrients mean that watermelon isn’t only a tasty low-calorie treat — it’s also very good for your health. 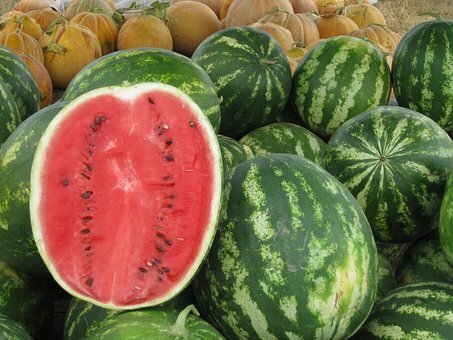 Note-Watermelon should be avoided by people with advanced kidney disease.